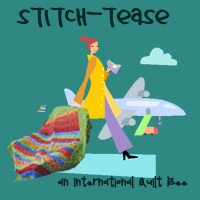 random thoughts...do or "di": A new quilt bee on Flickr...join me? I have been in love with the Japanese + and X block ever since I saw Leila's quilt. I can't put my finger on what has me so crazy for this quilt, but I knew when I saw it I had to make one. I want mine to be huge...for our king sized bed, so I decided a long time ago that when it was my turn to be queen bee in the New Bee on the Block that I would send out fabric for this block to be made by my group. It is a super scrappy quilt, so you almost can't make a mistake with fabric choices. January is my month, so I have been getting a jump on things and cutting fabric all weekend. 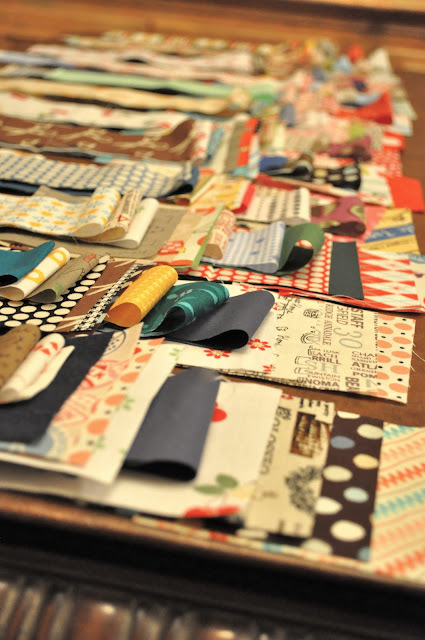 Because it is so scrappy, there is a lot of pulling fabrics and cutting just one strip or one square, so it is very time consuming. 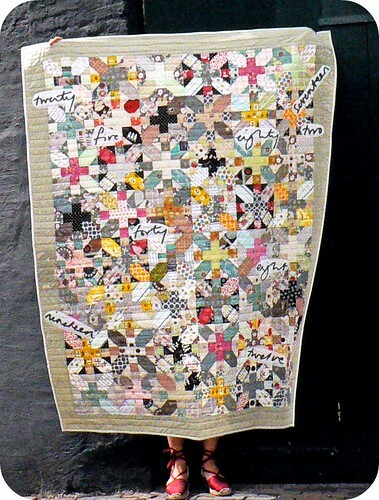 This quilt was inspired by Setsuko Inawaga's submission to the Tokyo Quilt Festival, 2011. Yesterday I discovered that another bee group is being formed to make these blocks. Since I am making 8" unfinished blocks, I think I will need about 120 of them to make this quilt. I need help, so what better way than to join another bee that is making them? This is where you come in. Hop on over to the Flickr group and join us. This is a super easy block that uses 7 different fabrics for each block, so see how being in a bee can help to make this such a fun and interesting quilt to make? Check out some of my favorites from other blogs and flickr members. 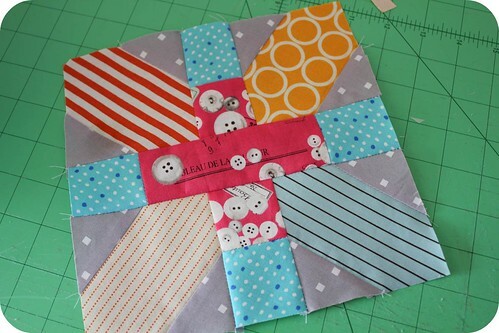 Amy has a tutorial on her blog of how to make this block. Heidi has made some really cute blocks with a lot of fussy cutting. 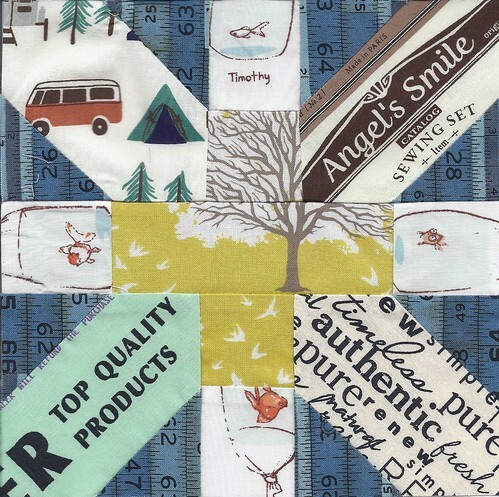 Hop on over to her blog and see all the beautiful blocks she has put together for this quilt. For more inspiration check out this Flickr site. I have fabric for 24 blocks ready to go out to my bee mates. I will start working on more blocks after Christmas...wait Christmas is in 26 days...I better get busy. I have so many things I want to make and I have not bought one single gift. HHHHEEEELLLLPPPP!!! Those blocks are great and look like a fun way to use scraps. Great idea using it for your bee blocks! I'll have to check out the flickr group. Thanks! Ooo...does this mean New Bee-ers get to do this for Jan? Ok, you may think I am totally naive for not knowing this, but how does a quilt bee work? I've always been interested in joining, but I've never known how to join one or what exactly the rules are... Could you enlighten me? Oh my what a great idea for a your month. And I am excited about swapping with you and others. A king size quilt will look amazing! I am sooo with you on the Christmas gifts situation, if I can't make them in the next 25 days they aren't getting any! Holey moley that's a lot of cutting!! But it will be worth it and totally gorgeous!! I really like this block. Please share with me what "bee quilts" are. Oh I can't wait for this bee, these look so fun! Thanks for blogging about the x and + flickr group. I've joined, and I'm very excited about this swap!